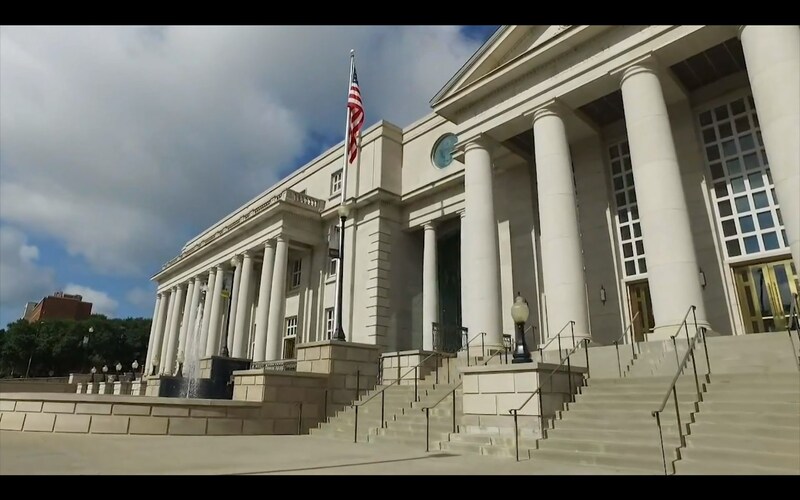 The National Center for Spectator Sports Safety and Security is established at the University of Southern Mississippi under the auspices of the Vice President of Research. The University of Southern Mississippi is recognized by the Carnegie Foundation for the Advancement of Teaching as a "Doctoral/Research-Extensive Institution." This national recognition validates the high quality of USM’s strong graduate and undergraduate programs. The NCS4 is partially underwritten by grants from the United States Department of Homeland Security and enterprise functions with the ambitious mission of supporting the advancement of sports safety and security in the United States and throughout the world. The research and educational mission of the National Center is accomplished by working in close partnership with industry professionals, researchers and academics, and national and international government agencies to develop and deploy practical performance improvement tools and applications that bolster the capacity of practitioners to respond effectively to the current and future safety and security challenges and issues. In the aftermath of September 11, 2001, the United States Department of Homeland Security identified sport venues as potential soft targets for terrorism. In 2006, The University of Southern Mississippi (USM) established the National Center for Spectator Sports Safety and Security (NCS4) in response to the nation’s emerging security needs. 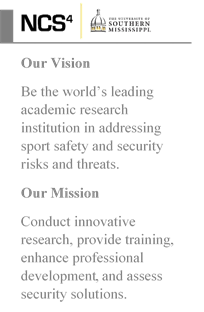 Today, NCS4 is the nation’s only research center devoted to the study and practice of spectator sports safety and security. It is a cornerstone in the scholarship arena as it represents USM’s innovative approach to research, training, and development. The idea for the National Center emerged from a 2006 doctoral dissertation about the standards required for effective security management at university sport venues. Building upon this fundamental research, the NCS4 is now an international research and education center for sports safety and security. The NCS4 collaborates with professional sport leagues and venues, intercollegiate and interscholastic athletics, marathon and endurance events, and international sporting events along with professional associations, private sector firms, and government agencies. Its partnerships bring together subject matter experts from government, industry, public safety, private enterprise, and academia to explore lessons learned and share ideas about best practices, strategies, training and certifications, and technology solutions for sport safety and security challenges. Why does the NCS4 matter? Since its inception in 2006, the NCS4 has played a critical role in helping the ever growing U.S. sports industry through thought leadership, professional development, and sponsorship of industry and academic forums. The Center promotes research, scholarship, and sports safety and security solutions through annual forums, professional certification programs, academic research, training, assessments, laboratory evaluations, and partnerships. What Benefit does the NCS4 provide safety and security decision makers? Through its standard setting research, scholarship, thought-leader summits and annual forum, the NCS4 employs research-based methodologies to develop industry best practices, quality training programs, capstone exercises, technology assessments, workforce competencies, and professional development offerings. Our Team has extensive experience in sports management, homeland security, emergency management, incident response, professional development, research, and education and training. Combining operational perspectives with collaborative research and education, the NCS4 at the University of Southern Mississippi contributes expertise in translating lessons learned into best practices, professional competencies, cutting-edge research, and tested and validated technology solutions in safety and security.